Yesterday, Christian Rieder of Fraunhofer MEVIS successfully defended his Ph.D. thesis entitled Interactive Visualization for Assistance of Needle-Based Interventions at the Jacobs University Bremen.Supervised by Horst Hahn, Christian made a number of significant contributions in the last years, leading to strong publications at VisWeek and EuroVis, and a MedVis-Award distinction in 2010. Thus, it was not too surprising that the thesis was assessed with the highest possible grade. 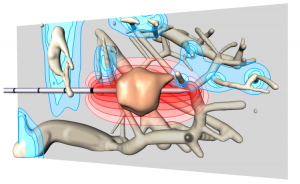 Visualization from Christian’s 2011 VisWeek paper showing RF applicator, tumor, the approximated ablation zone in red and thermal cooling of blood vessels in blue. 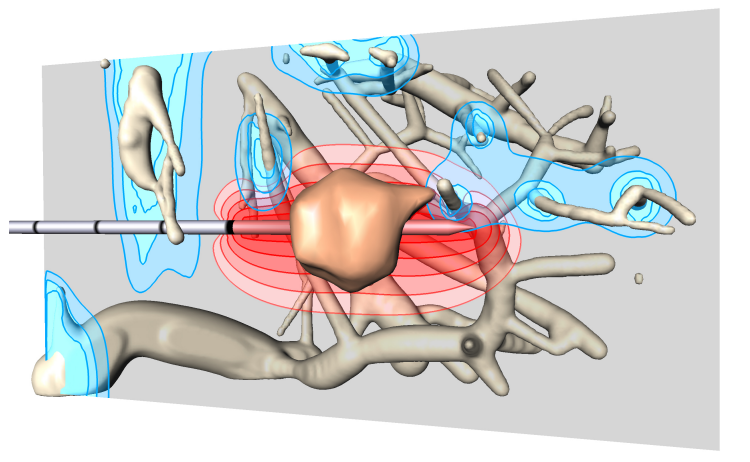 Christian’s work aims at supporting clinical workflows, primarily in radio frequency ablation, supporting both the pre-interventional as well as the interventional stage with highly advanced and carefully adapted visualizations indicating tumors, risk structures, security margins as well as results from approximative simulations that predict the thermal lesion produced by RFA. Illustrative techniques, smart map projections, very efficient GPU realizations as well as careful evaluations with relevant physicians are landmarks of Christian’s work, which may be explored on his website in detail.